Let’s take a break from the 1960s and take a look at what Bond was wearing just two years ago in Quantum of Solace. Starting in this film Bond wears suits by Tom Ford, and much of the details have been publicly described by costume designer Louise Frogley herself, most notably the shiny mohair tonic reminiscent of mod suits of the 1960s. She said, “It was extremely popular in the ’60s; all the Mods and all the wannabe Bonds wore it. I’m sure Sean Connery would have worn it at least once.” Conney’s Bond always struck me an an anti-mod, and in Goldfinger he even made a disparaging remark about the Beatles. Connery, however, did wear mohair-blend suits on occasion, but they weren’t the flashy type of mohair tonic. Bond’s suits weren’t supposed to stand out as Daniel Craig’s suits do. Tom Ford has a much flashier look overall than an English bespoke suit, and one that doesn’t fit Ian Fleming’s character. There are at least four distinct suits featured in Quantum of Solace but for now we will focus on the midnight blue suit pictured above. At first glance it would appear that this suit is black but a few well-lit shots and promotional images show that the suit is actually a dark midnight blue, the same as his dinner suit. Black is not a traditional colour for a lounge suit and isn’t one that Bond wears often. The only time Bond wears a black suit is in Diamonds Are Forever, and it was the ideal choice for when mourning his “brother”‘s death. Midnight blue looks just about black (and sometimes blacker than black) but will shine blue under a bright light (see picture below). Black under a bright light will usually look brown or green. Midnight blue has a richer and deeper quality than black. This suit has a three-button front but the lapel is rolled down to the middle button so it behaves like a two-button suit. The button configuration is known as a button two, show one or a three-roll-two. The cuff has the five buttons that are typical of Tom Ford but Craig leaves the last button open. It’s an ostentatious practice that I usually don’t recommend, but as there is one more button than usual here undoing the last one makes the cuff look not so crowded. The pockets are straight with flaps plus a ticket pocket. The trousers are flat front with a medium rise, higher than the standard Tom Ford suits. The bottoms of the trousers have turn-ups (cuffs), and contrary to what many people say these days, turn-ups are fine with flat front trousers. Turn-ups and pleats are independent of each other and it all comes down to personal preference. 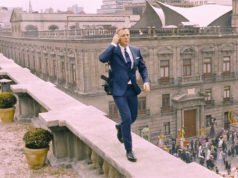 Both Daniel Craig and Pierce Brosnan wore flat front trousers with turn-ups. The trousers also have buckle side-adjusters, placed on the waistband seam above the side on-seam pockets. All of the suits in this movie have the same features. The shirt is a plain white poplin with a spread collar, double cuffs and no pocket. The tie is a blue and white basket weave. Bond’s shoes are the Church’s Philip model in black, which is a perforated cap-toe oxford (balmoral to the Americans). I thought that Bond also wears a black suit during the climax of Goldfinger at Fort Knox, as he was basically going to his own funeral. I could be wrong, but that's what I always believed. In some shots it does appear black but it's a dark brown, very dark but not black. When Bond stands next to Oddjob who is wearing black, Bond's suit is noticeably lighter. Wow, I'll have to take another look at that. I don't like any of the Tom Ford suits on DC…something just does not seem right and seems a bit too flashy for a secret agent. Also due to DCs over muscled physique his arms don't fall straight, making the shoulders look odd. I agree. Whilst Tom Ford suits can be very nice they are not appropriate for James Bond, especially not in mohair tonic. Please, he looks exactly as he needs to look for his work. The clothes, like the man and his mission, should evolve to fit modern and situational interpretation otherwise the franchise risks becoming a period piece. As Vespa said in Casino Royale when presenting the Brioni tuxedo to Bond. "I need you looking like a man who belongs at that table." That's what this is. Yes, perhaps he's walking a fine line between dandy and functional and yet do we not study Bond because some part of us wants to be as effective and stylish in our day-to-day living? Anon 2, the mohair tonic brings Bond back to the 60s, not to the present. And it just looks flashy. Bond should dress elegantly, and perhaps expensively to fit in with his crowd, but the extra flash is unnecessary for a secret agent. I don't have a problem with Tom Ford's cut, and his more recent clothing resembles English suits from the 70s more than most other modern fashions. I found it interesting the information on how to determine a midnight blue suit as opposed to a black. I just bought a Douglas Hayward suit (vintage 1981) in the "Bond" style of the time, low button stance and the seller advertised it as "dark grey". It was darker and appeared almost black but when viewed in light appeared to have more of a dark, dark blue hint to it. Midnight Blue I assume? Can you tell me how many times Bond has worn a Midnight Blue colour lounge suit and in which films? Quantum of Solace is the only time Bond wears a midnight blue lounge suit. I consider midnight blue to be in the black category more than in the blue. It's like a richer and deeper black that only looks blue in a bright light. It's better for a dinner suit than a lounge suit. But in the way that Bond wears it here, it's more like a substitute for black tie. The formality of this event is just short of black tie. Great Blog, Matthew, but there are a number of factual inaccuracies of which your reference to this suit being a dark midnight blue is one. In 'Quantum of Solace' the lounge suit Daniel Craig as Bond wears to the Green Planet cocktail party in La Paz (and which is then gradually destroyed during the remainder of the evening and the following day over, in and under the Bolivian desert) is a dark charcol grey – almost black. Presumably it is the same suit worn in early scenes with M at Michell's apartment and MI6 headquarters. Following the film's theatrical release in late 2008, a number of official Danjaq licensed collector's costume cards were released, each containing swatches of the original clothing worn by Craig and other cast members. The costume card range includes swatches of all three suits worn by Craig and I purchased a number of these in order to ensure that fabrics used when tailoring replicas of all three suits matched the original fabrics as closely as possible. Ben, I have the costume cards and I'm sorry, but this suit is indeed midnight blue. The blue shows up quite clearly in contrast to the black on the eBay link too. The swatch matches up closely to my own midnight blue clothes. The guys over at AJB007 also take the swatch to be midnight blue. Is your swatch one of the dirty ones? That could make it look grey. On my card of the blue pinstripe suit one is clean and one is dirty, and the dirty one looks grey. What is the color of the suit in the Mitchell appartment scene… anyone? Is it proper to roll the lapel down? Another Question: If the event was just short of black tie why doesn't bond wear a midnight blue, peaked lapel, one button suit? The lapel is not just rolled down, it is cut that way. Because of where the collar meets the lapel, this suit cannot close at the top button. A 3-roll-2 cut is the tailor's responsibility and has little to do with the way the suit is pressed. But the lapels cannot be pressed flat. Bond's suit is perfectly acceptable for the event. Just because it is a more formal event doesn't mean his suit jacket needs to be cut like a dinner jacket. In that picture, because the suit is covered in dirt the blue is hard to see. Bond's shirt was originally white, so that says how much dirt is on Bond's clothes. I have the costume card that Ben mentions, and even in the picture on eBay I can see that it is dark blue, not charcoal. The blue tie further brings out the blue in the suit. 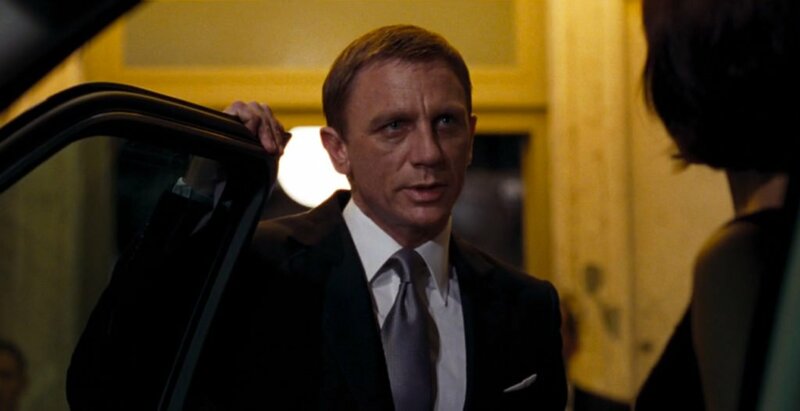 The suit Bond wears in London is charcoal. Screenmusings.org actually has another screenshot of this suit and it shows clearly under sunlight that it has a subtle blue sheen. It confirms that it is midnight blue. Can a shawl collar loumge suit be worn for slightly more formality? A shawl collar lounge suit best be avoided for all situations. Matt, I have a question about the shirt collar and the tie knot. On AJB, there have been some recent discussions on this topic, and it has been put it there that the collar is a “Duke of York” collar and the tie knot is a pratt knot. What is your take on this? The “Duke of York” is what T.M. Lewin calls it’s semi-spread collar. The knot is not a Pratt knot as in one scene when Bond unties the tie it is not inside out. Because the knot is not totally symmetrical it is a four-in-hand. The heavier silk and interlining makes the knot look cleaner. Matt, could all the QoS tie knots be the “Old Bertie Knot” instead? I have just learned about it this yesterday and tying it for work today, I notice my 3″ necktie made pretty much exactly the same shape as in the film, even down to the dimple and drape under the knot. Yes, it could be that. It looks very similar. I think it’s a more likely candidate for Bond’s tie knot in Casino Royale. It depends on how often you wear it, but if a suit is in regular rotation you should clean it once or twice a year. Any stains should try to be removed first by brushing and spot cleaning. Smells should be aired out. Only dry clean when necessary. I was wondering about the shirt. In the lighting for the film it looks plain white, but in this wallpaper I found, the shirt clearly has a self stripe to it. Now I know this is a fan-made wallpaper, but they had to get the picture of bond from somewhere. Based on the color of the tie I assume that he’s wearing the Blue suit combo, but then why would his shirt be striped unless it was that way in the film? In an event like this, would you prefer to wear a deep charcoal suit, midnight blue, or maybe even black suit? Howcome Bond doesn’t wear a deep charcoal? Do you think that midnight blue would be o.k to wear as a business suit? Also because this is a late night event, howcome this suit wasn’t made with a peak lapel? I always think that peak lapels look amazing on nightime suits, and this is one? I think people have become too afraid to wear peak lapels on suits, maybe because it gives an aggressive and mean feel that some people do not want. However, that is a feature that is absolutely essential to Bond, so he should portray himself like that. Esepcially because Craig has played a more serious and meaner Bond than any of the other actors. If I were the costume designer, almost all of his suits would be with peak lapels. And they look good on 3-roll-2 suits and especially because this is a Tom Ford suit. Midnight blue suits are the best for the evening. Black suits should only be worn for funerals. Charcoal doesn’t look as rich as midnight blue, particularly under artificial light at night, so Bond usually wears it during the day. He also wears a deep charcoal suit in Quantum of Solace. Bond wears a charcoal suit at night in The Man with the Golden Gun. Peaked lapels would go nicely on this suit, and they look fine on a button three suit with a rolled lapel. But Bond follows traditional conventions, and single-breasted lapels on a single-breasted suit are what is traditional. Peaked lapels on a single-breasted suit is absolutely not essential to Bond. To Bond they most likely come across as too flashy. I’ve told you this before. If you are considering peak lapels to be “flashy” on a suit, then why is it not on like that on a tuxedo when they are more formal than suits? Also flashy could also mean like wearing a red suit or wearing Lebrons with his suits or wearing ties with patterns like your school’s logo on it. So I don’t get it why people wear peak lapels on suits if it looks “flashy”, and in that case you might as well wear a red suit with Lebrons nike shoes and a tie with a Monta Vista High School(my school) logo. Why do you say that peak lapels are “flashy” but more formal than notch lapels? It’s a traditional detail for dinner jackets, but not for single-breasted suits. Peaked lapels are more formal than notched lapels, which is why they’re traditional on dinner jackets but not on single-breasted suits. And dinner jackets are more formal than suits. That’s why peaked lapels are flashy on single-breasted suits. There are different levels of flashiness. I think ‘flashiness’ here, refers to bad taste. 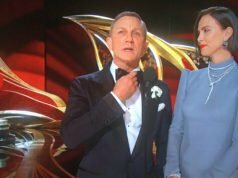 Any traditional dresser ( such as James Bond), would consider peaked lapels on a single breasted jacket to be at the very least odd, and flashy and peculiar at worst. In fact, if you listen to interviews with old Row tailors, they actually refer to peaked lapels as ‘db lapels’, so even they would probably consider them out of place on a single breasted jacket. As for red suits paired with jordans, that’s both flashy and in exceedingly bad taste, just about any way you look at it, in my opinion. Hope it helped! I was wondering whether the suiting here is sharkskin, birdeyes or is it something else completely different? It’s a plain midnight blue. I apologize for the lack of understanding on my part, but what exactly enables a suit pattern to be considered plain? I mean every suit fabric up close seem to have some woven pattern to it. What exactly then would enable a suit to be considered plain? Does it have to look so from a particular distance? Or is it the appearance from the general pattern that constitutes the pattern (for example on a herringbone fabric, the pattern runs from the top of the suit to the bottom)? I’d really it if you can enlighten me on this matter. There are weaves, there are patterns, and there are specific patterns that derive from specific weaves. A pattern needs to be in at least two different colours to be a pattern. Sharkskin is purely a pattern, whilst the weave for sharkskin is a 2×2 twill. Houndstooth, chalk stripe and pinhead are examples of other patterns. Birdseye and herringbone are both weaves and patterns. Most birdseye-woven cloths are made in two different colours to create the birdseye pattern that is unique to the birdseye weave. This midnight blue suit is plain because it is a solid colour in a plain weave. There is no pattern to it. Thank you Matt. That was very useful. In the case of tie color, how does Bond do that? Do certain colors of ties have different levels of formalities like suits do? I would think that any tie that is in a loud or really bold color wouldn’t work. The only ties I really have seen him wear are shades of blue and gray. Other than that, the only colors are probably red, brown, and black. When looking at people who wear suits on a regular basis, the colors of ties they wear are in shades of blue and red, sometimes even black and pink. Businessmen almost don’t wear gray or brown ties with their suits. If Bond is a businessmen in his cover, howcome he doesn’t wear ties in muted shades of red and pink even though they are appropriate for him. Tie formality comes from the pattern, with solid ties being most formal. The smoother and shinier a tie is the more formal it is. Bond has established that he wears subtle ties that don’t stand out. That’s his style. Many businessmen wear the same kinds of ties that Bond wears.